PANAMA CITY, Sep 16 2014 (IPS) - Panama is the first Latin American country to have adopted a national strategy to combat what is known as hidden hunger, with a plan aimed at eliminating micronutrient deficiencies among the most vulnerable segments of the population by means of biofortification of food crops. The project began to get underway in 2006 and took full shape in August 2013, when the government launched the Agro Nutre Panamá programme, which coordinates the improvement of food quality among the poor, who are concentrated in rural and indigenous areas, by adding iron, vitamin A and zinc to seeds. “We see biofortification as an inexpensive way to address the problem by means of staple foods that families consume on a daily basis,” Ismael Camargo, the coordinator of Agro Nutre, told IPS. Panama has pockets of poverty with high levels of micronutrient deficiencies, he explained. In 2006 research began here into biofortification of maize; two years later beans were added to the programme; and in 2009 the research incorporated rice and sweet potatoes, as part of a plan that is backed by the National Secretariat of Science, Technology and Innovation. Panama’s Agricultural Research Institute and academic institutions are involved in Agro Nutre, which has the support of the Food and Agriculture Organisation (FAO), the World Food Programme (WFP), and Brazil’sn governmental agricultural research agency, Embrapa. Some 4,000 of the country’s 48,000 subsistence level or family farmers are taking part in the current phase, planting biofortified seeds. Adding micronutrients to staple foods in the Panamanian diet became a state policy in 2009. So far, five varieties of maize, four of rice and two of beans, all of them conventionally improved and with a high protein content, have been produced experimentally and approved for release. “The project began in rural areas, because that is where the extreme poverty is, and where farmers produce for subsistence,” food engineer Omaris Vergara of the University of Panama told IPS. According to Vergara, the biggest hurdle for the expansion and growth of Agro Nutre is the lack of research infrastructure. “The project is focused on vulnerable populations. Academic institutions will carry out impact studies, but they haven’t yet begun to do so because the studies are very costly,” said the engineer, who sees the lack of research facilities as the weak point of the project. According to figures from Agro Nutre, of the 3.5 million people in this Central American country, one million live in rural areas. And of the rural population, half live in poverty and 22 percent in extreme poverty. But the worst poverty in Panama is found among the 300,000 indigenous people who live in five counties, 90 percent of whom are poor. Isidra González, a 54-year-old small farmer, had never heard of improving the nutritional quality of food with micronutrients until she and her oldest son began five years ago to plant biofortified seeds on their small plot of land in the community of Hijos de Dios in the district of Olá, which is in the central province of Coclé. Now the 70 families in that village next to the only road in the area produce biofortified crops: beans on small plots climbing tropical lush green hills and rice on nearby floodable land. “I think these seeds are better and produce more. They grow with just half the amount of water,” González, who has been involved in the project since the experimental phase, told IPS. “People like these crops because they have more flavour and are really good – my kids eat our rice and beans with enthusiasm, you can tell,” she added, laughing. 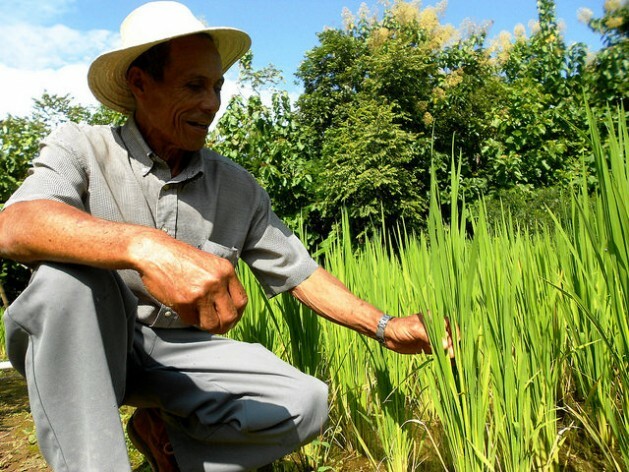 Vicente Castrellón, a 69-year-old local farmer, plants improved seeds and became a community trainer to help farmers in the district. “We are producing three harvests a year, I provide technical support for other farmers. For now it’s for family consumption, but some grow more than they need and earn a little money selling the surplus,” he told IPS. “Life here is very expensive for farmers like us,” Castrellón said in Hijos de Díos, which is 250 km from Panama City, over three hours away by car. He added that it was not easy for the families in Olá to switch over to biofortified seeds. “It took nearly a year to get them to join Agro Nutre,” he said. “But now people are excited because for every 10 pounds that are planted, they grow 100 to 200 pounds of grains,” he added, proudly pointing to the rice plants on his plot of land. The inclusion of the fourth crop, sweet potatoes (Imopeas batata), was a strategic move, researcher Arnulfo Gutiérrez explained. The sweet potato, which had nearly disappeared from the Panamanian diet, is the world’s fifth-largest crop in term of production and FAO is promoting its expansion worldwide. The incorporation of sweet potatoes in Panama has the aim of boosting consumption and in 2015 two or three improved varieties are to be released. Luis Alberto Pinto, a FAO consultant, forms part of the Agro Nutre administrative committee and is the national technical coordinator in the first two indigenous counties where improved seeds are being used, Gnäbe Bugle and Guna Yala. “We are working in four pilot communities,” he told IPS. “In Gnäbe Bugle we are working with 129 farmers in Cerro Mosquito and Chichica, and in Guna Yala we are working with 50 farmers on islands along the Caribbean coast. Besides science and production, the project requires constant lobbying of legislators and government ministries, to keep alive the political commitment to biofortification as a state policy. Eyra Mojica, WFP representative in Panama, told IPS it now seems normal to her to walk down the corridors of parliament and visit the offices of high-level ministry officials. By 2015, the WFP hopes to introduce cassava and summer squash as new biofortified crops. Biofortification of staple foods with micronutrients, to reduce hidden hunger, was developed by HarvestPlus, a programme coordinated by the International Center for Tropical Agriculture (CIAT) and the International Food Policy Research Institute (IFPRI). A small detail, but it isn’t spelled Gnäbe Bugle, it is Ngäbe-Bugle. The “Ng” is a velar nasal.